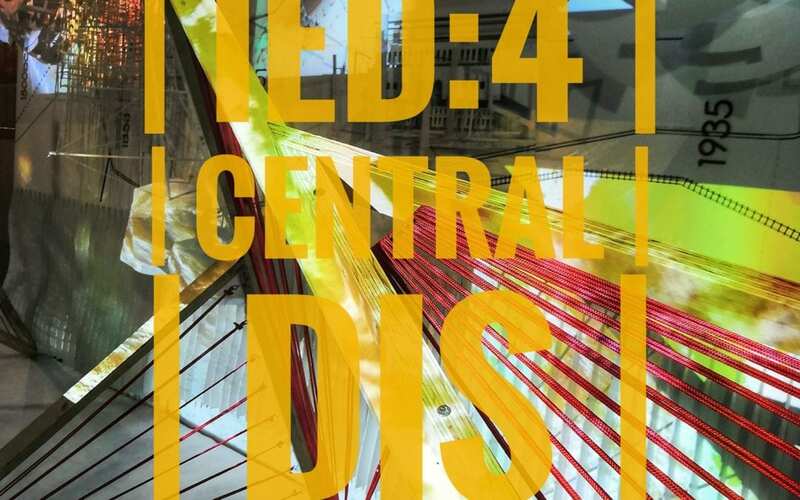 On Saturday, 17/11/2018, the graduating class of Interior and Environmental Design held the opening for their installation and upcoming exhibition Central Dis-chord. Collaborating with Dundee City Council’s initiative ‘Design your Dundee (Christmas)’ and making the installation as part of the RIAS Festival of Architecture 2018, the students have worked arduously over putting together a multi-layered and enfolding experience. It lasted from morning to afternoon and was rewarding for both the maker and the attendants. Having attended the installation and interviewed some of the creators, the story about the motives and the conception of the exhibition is just as gratifying and meaningful as the exhibition itself. The students were looking for inspiration in the city of Dundee itself. They wanted to have a wholesome and tasteful design, which would be incorporated soulfully and in an unblemished by the urban landscape itself. What is driving them is the desire to find themselves in the present, trying to come up with something which will change in their own terms, significantly and substantially. They are trying to be incorporated by their field of their work, so they will be able to uncover how they can add their own significant touch to the shifting scape. The installation itself comprises of multiple designs, which are meant to stimulate the experience of any visitor. It is a post-humanistic statement and deconstruction of the swiftly shifting urban landscape, as well as the mentality and viewpoint of their denizens. The installation manages to make a statement about how vast a small city like Dundee can be. There are spaces which are neglected; other locations which will be refurbished and polished; others will simply fade and dwindle in memory, like grubby graffiti, still there but no longer with the same meaning. This installation truly is an outstanding achievement of the capabilities of modern art. The groups of people that have put it together have paid attention to every possible aspect. From the symbology that the exhibits want to convey (an array of massive, harp-like constructed triangles) to the background itself (a map of the city of Dundee, pinpointing and highlighting the presence of the monuments constructed, achieving the abstraction of viewpoint through a specific perspective), the exhibition resonates with like a bell; its tune being the energy and vim of the young creators. The exhibit has an engaging and interactive role. When putting it together, its creators, whishing for the visitors to have as much of a stirring experience as possible, have made a flux of stimuli: the scale models of the historic monuments of Dundee are placed parallel to the ground, jutting out of the wall, giving a jarring and intriguing angle; sounds have been employed, not to deliver the reality and the everyday condition of the location, but rather the essence conveyed (for example the Observatory was matched with bird chirping). There is the extended use of video and projections, in order to assimilate the thinking process of the visitors with the notion of the ceaseless flux of development. Even the location of the installation itself is of critical importance: held in an underpass, in the Castle Street pend, the students have selected this location exactly because it conveys the very message, they are trying to state themselves. The pend used to be the “burrow” where an arcade was found in the 80s, but since the views and fads have shifted towards the city’s waterfront, it is now forgotten and dishevelled. Yet, like so many things we might overlook it remains as part of Dundee. Cities are bombarded with spaces and locations which are overseen or forlorn but that does not mean that they should be forgotten. Finding themselves in the midst of changing paths, the are trying not to follow the way, but rather make their based what has already been and in tune with what will come to be. I have found this exhibition to have a startling depth, moving in cadence with post-humanistic views about how cities are alive, about the process of internalisation of the cityscape as well as remembering. Dundee is no exception: what the students referred to as “the old city” or the “dead zone” (centred at the East End and its fringes) has been overlooked. The essence of the exhibit is to make a statement. About the nature of our reality, how it can be not so kind sometimes and the way is much broader than even our horizon can encompass. The atmospheric character of the exhibit will return in December, in DJCAD, giving everyone the opportunity for some reflection. The reciprocal and intuitive quality of the exhibition can also be seen by the fact that the students have documented not only the process of devising and preparing the installation, but also reactions, comments and feedback from the opening day. Among the most significant contributors for the completion of this exhibition were Gary Kennedy, the tutor of the students/creators and Sarah Craig, of the Dundee City Council. On a closing note, this exhibition has reminded myself to stay on my toes, as there are so many notions and perspectives out there that I can be exposed to and enquire a novel notion. This exhibition is a panel between the city and its residents. The IED students pose the questions, while both the city and its residents hold the answers.